Description: This mecha model transforms into a hovering vehicle for moving over tough terrain. "Stings like a Bumblebee! -30 Defense"
Description: A quick dashing punch attack that has a high output and punches through enemy defense. "Ultra Magnum: Armor Pierced -10 Defense"
"Prime Shot: Armor Pierced -10 Defense"
"Chance for extra shot or double extra shot"
Description: A High caliber chain gun that shoots extra rounds and shreds enemy amor! "Target Lock! +15 to Attack Bonus!" "Target acquired! +15 to Attack Bonus"
"Chance for extra hits or double extra hit"
Description: High accuracy machine guns that hit with high damage shells. it can recalibrate your targeting sensors for improved attack bonuses. Every hit have a chance for "Hot Rodding! Attack Bonus +5!" 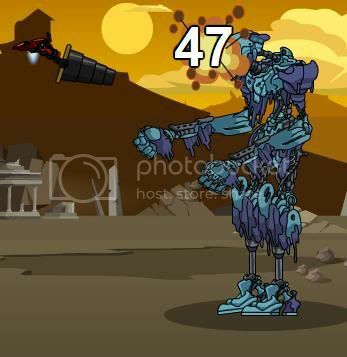 Description: Transform into Hover mode and charge at your enemy with high speed and laser pulses. "Head Mastery Increasing +X% Damage Boost! ", Increases Damage for the round, where X is from 10-20% damage. "Head Mastery +X Damage", Where X is 25-40 Damage Boost. Description: A head that can separate from the body attack! It has a high crit chance and increases weapon damage!